Margaret A. 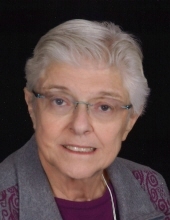 “Marge” Kress, 78, of Terre Haute passed away Thursday morning, March 14, 2019 in Union Hospital. She was born August 7, 1940 in Detroit, MI to Frederick Franzwa and Elmore Haupt Franzwa. Survivors include her husband of 53 years, Robert A. Kress; daughter, Julie Eldred of Columbus, IN; son, David Kress (Fiona) of Carmel, IN; and six grandchildren, Shelby Eldred, Lauren Eldred, Logan Eldred, Matthew Kress, Megan Kress and Marie Kress. Also surviving are two brothers, Robert Franzwa (Nancy) of Peoria, IL and James Franzwa of Solana Beach, CA; a sister-in-law, Rita Callahan (Bob) of Terre Haute; and several nieces and nephews. She was preceded in death by her parents. Marge was a graduate of Schulte High School and was a member of St. Benedict Catholic Church. She was active in Camp Bluebird and enjoyed playing cards and Bunco. Mass of Christian Burial will be conducted at 12:05 PM, Monday, March 18, 2019 in St. Benedict Church, 111 South 9th Street, with Father Martin Day, OFM Conv. officiating. Entombment will be in Calvary Cemetery. Visitation is scheduled for Sunday from 4:00-8:00 PM with a Rosary to be recited at 7:30 PM in Callahan & Hughes Funeral Home, 605 South 25th Street. In lieu of flowers, memorial contributions may be made to St. Benedict Church Soup Kitchen, 111 South 9th Street, Terre Haute, IN 47807 or to Sisters of Providence of St. Mary-of-the-Woods, Mission Advancement office, 1 Sisters of Providence Road, Saint Mary-of-the-Woods, IN 47876. Funeral information and memorial tributes may be found at www.callahanandhughes.com. To send flowers or a remembrance gift to the family of Margaret A. "Marge" Kress, please visit our Tribute Store. "Email Address" would like to share the life celebration of Margaret A. "Marge" Kress. Click on the "link" to go to share a favorite memory or leave a condolence message for the family.